Content by Tony Macklin. Originally published on January 31, 2019 @ tonymacklin.net. Stay Human is mistitled. It should be titled Stay Positive. The director, narrator, and lead performer is Michael Franti, an accomplished musician with an international following. 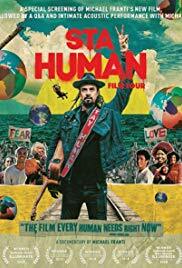 Stay Human is Franti's odyssey toward self-discovery and an effective voice for change and idealism. He takes us through stories about idealists across the world. His focus is on those who are making a difference. But perhaps the most influential story is a personal one that takes place in Atlanta. It is about a wife (named Hope, of course) and her husband Steve, who is stricken by ALS (Lou Gehrig disease). It's a portrait in courage. It's both disturbing and uplifting. Franti says they changed his life. The other vignettes all are revelatory - a midwife in the Philippines after a disastrous typhoon, an activist in Indonesia trying to replace deforestation with bamboo, and a school in South Africa that educates and prepares young people for a better life in the future. But none have the power of the Hope-Steve section. One shortcoming of Stay Human, for all its potency, is that it fails to take full advantage of the power of its episodes. Editors John Roderick and Anthony Thoen often let the sequences go too long and become redundant. And their arrangement doesn't always promote their relative strengths. They aren't a hodgepodge, but their order lessens their potential impact. Ironically, although Franti is after the essence of his life, he essentially keeps his wife Sara off-screen. One can find out about her on a video Michael released when he proposed to her. She's a producer, and I imagine she was a significant part of his life, after his first wife Tara. But until the credits we don't know he is married. Maybe Michael Franti is suggesting that makes for an optimistic experience.